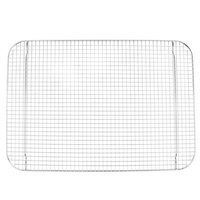 Make pans easier to clean, and cool baked goods fast with this 16" x 24" full size footed cooling rack. 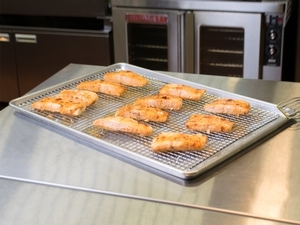 It can be hard to remove stubborn, baked-on food particles, so save yourself time and effort in the cleaning process by cooking smarter, with this 16" x 24" footed cooling rack! 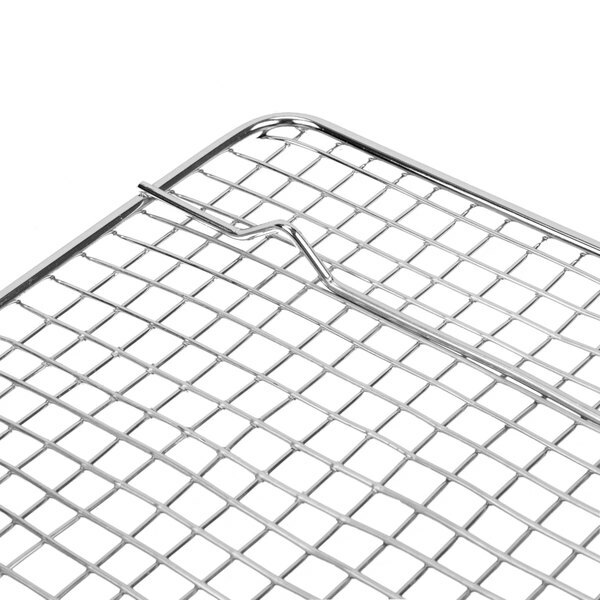 This full size rack can be used to elevate food off of a full size sheet pan so that you have less to clean up, or you can use it to cool baked goods on a countertop. 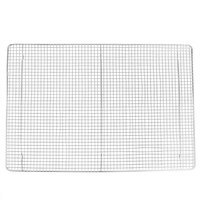 "These footed grates are amazing and an absolute steal at this price. We use them to elevate our loaves of bread to cool faster and more evenly after they come out of the oven"
This rack can be used as an easy way to hold a variety of cooked foods off of the pan surface. 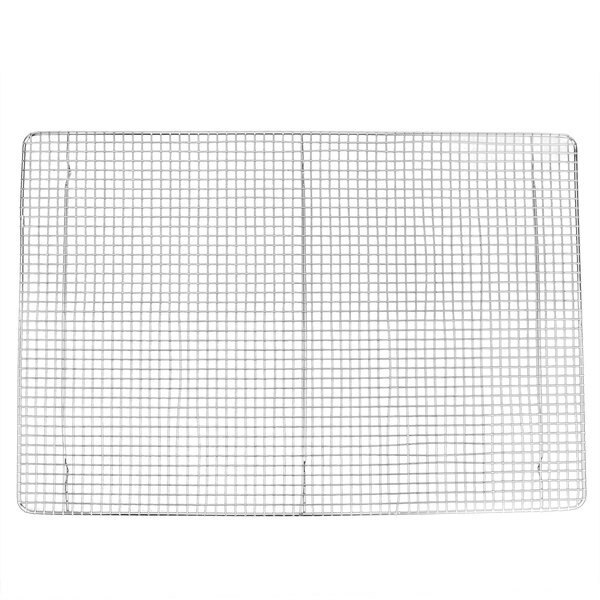 This ensures that you'll have less baked-on food material and an easier time cleaning the pan. Alternatively, you can use this item to cool baked goods. The elevated design allows even air circulation on all sides of your foods, and without the hot pan underneath they will cool faster. It features a footed design to give it a slight elevation off of your pan or countertop, for improved air circulation. This rack is designed to fit within a full size sheet pan, making it the perfect way to cool and cook all of your culinary creations. Great cooling racks! Been using them for over a year and no warping, no breakage, no rust! No rough spots either. I bought some from another site and they scratched the heck out of me, rusted, and shredded the wash sponge- never again! These are a great value and truly sturdy. 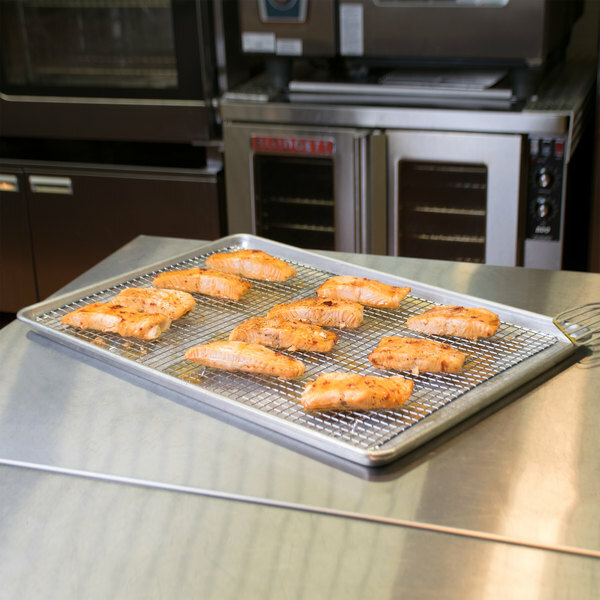 These cooling racks work great for our small batch bakery! They are the perfect size for our mini bundt (20 compartments) and muffin pans (24 compartments). Like this cooling rack. It's a great asset in the kitchen while baking! It is very sturdy, well built and is a must have to any baker! Works great. I own a cake studio and use these for cooling my cakes out of the oven. It's nice that it's supported in the middle so it doesn't bow. A must have for any baker! We can cool 3 dozen large cookies on the cooling rack at the same time. It is easy to clean and has not rusted. Great full size rack. We use for a bunch of different applications from baking to curing meat. Works perfectly! Easy to clean and durable. Incredible price! a+++ item as described. These are perfect for cooling almost anything!! the size is perfect for cooling our round cakes- full sheet! Will repurchase as needed. These racks have a lot of usage, put items to drip grease after cooking, place my donuts for the dripping glaze. also use for my pastry and for chocolate to drop off. good rack that every food business can use. We depend these sturdy racks to provide circulation for our products. 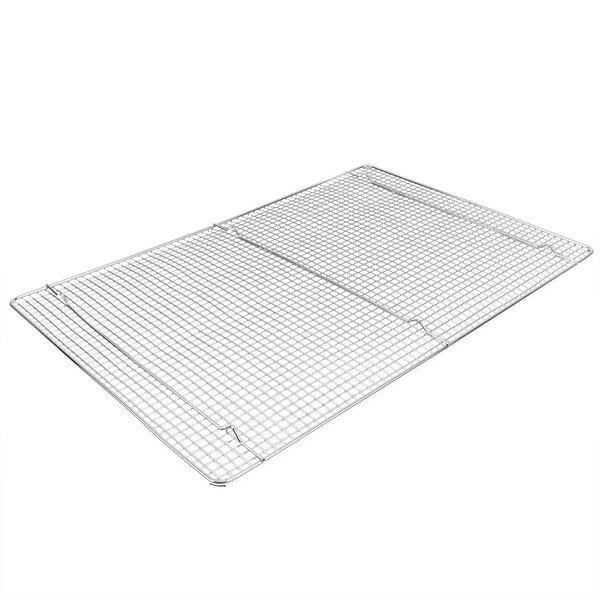 They fit our full size sheet pans perfectly and are easily cleaned and sanitized. Cooling rack does exactly what it's supposed to do. The gauge of the metal was more solid than expected and it fits into a full size sheet pan very well. These cooling racks are great for letting air flow underneath our baked goods, to prevent sogginess. The footed feature ensures it does not move around the pan. Racks like these are essential to a restaurant or bakery. 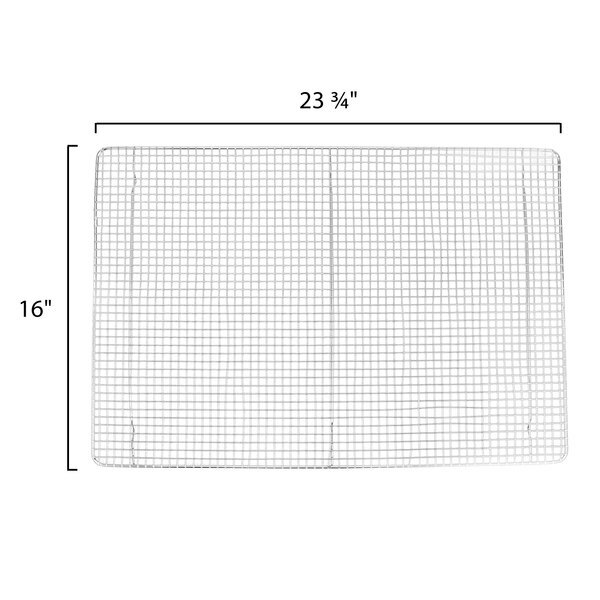 They fit perfectly in a full sized sheet pan and work with roasting items, or cooling items. 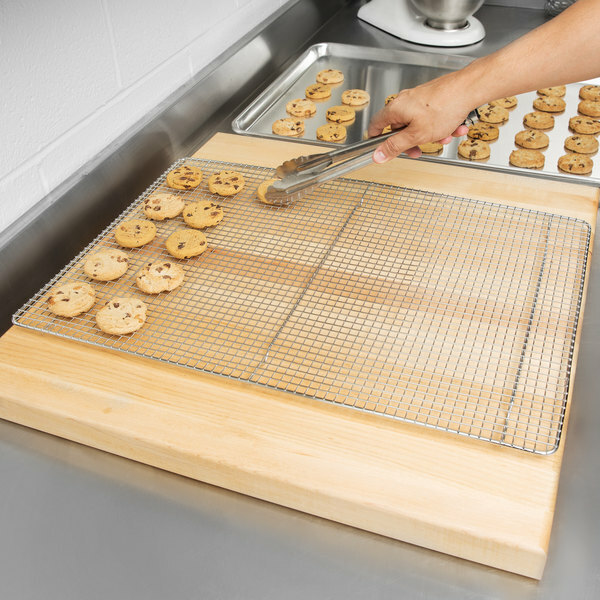 This cooling rack is awesome for my cookies, muffins and even cakes. Although, it is something so simple it definitely makes a big difference in my kitchen. When I bake I usually do big batches so I usually put my first batch of pastry on the rack and then prep the next for the oven. I recommend this rack. I’ve been using this to cool down macarons when they come out of the oven. It fits two of my Silicone mats. It is large and it’s exactly what I wanted. EXCELLENT Full size cooling rack!!! 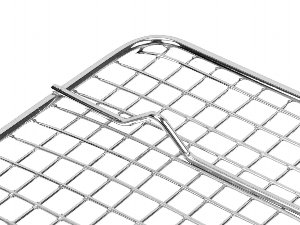 We do tons of baking and always looking to purchase cooking racks.... this one works perfect for our larger rounds that the smaller ones don’t! We use these primarily to make our oven fried chicken. 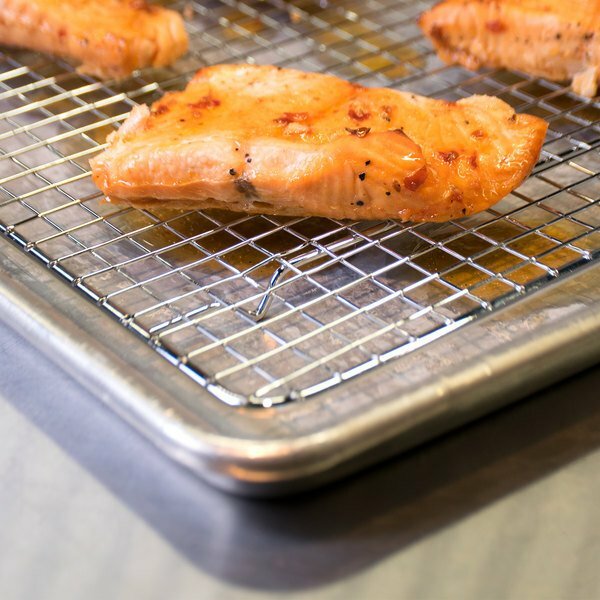 Fit perfectly in a sheet pan and help the chicken come out crisp and crunchy! Easy to clean. Well-made and sturdy cooling rack. You can try cooling all sorts of things on this (maybe use for draining excess grease off deep-fried foods). Helpful. 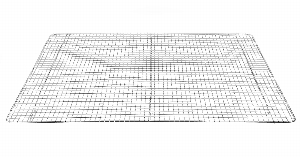 Fits conveniently inside the standard Full Size Sheet pan.